The investment giant Goldman Sachs is the gold standard for many aspiring investment bankers. Holding 34,800 employees worldwide, the company was founded in 1869 and headquarters in Manhattan. Goldman Sachs has also been a proving grounds for many future government officials, like Robert Rubin and Henry Paulson, two former Secretaries of the Treasury. So how do you get a job with Goldman Sachs? What kind of people do they look for in their internships, and what’s it like to work there? An internship with Goldman Sachs is a great way to get a foot in the door with the company. Sandra Hurse, global co-head of recruiting at Goldman Sachs said “If we can fill 100% of our hiring needs from our summer internship program, we will.” An internship isn’t easy to get though, out of 17,000 applicants for a summer internship in 2013, only 350 were hired. That’s a 2% acceptance rate. The hiring process at Goldman isn’t strictly for business majors though – Suzanne Gauron, a managing director in the investment management division, worked as a summer intern after her junior year and studied 18th century poetry in school. The key to getting hired, according to Gauron, is to show expertise in a field you’re passionate about. You don’t necessarily have to be an expert on all things finance, but demonstrating a passion for a project and then growing with it prove a self-starter quality that Goldman Sachs keeps an eye out for in applicants. If you secure an internship though – expect to work long hours. Goldman recently input a rule that interns must leave by midnight and cannot return until 7 am. In other words, before this rule was in place, interns were staying at the office for more than 17 hours at a time. According to Glassdoor, summer interns earn a monthly salary of $5325, which may sound like a lot, but when you take into account 17 hour workdays and an average of 22 work days a month, that’s only about $14 an hour. Wall Street is famous for its high paying salaries, so how does Goldman Sachs stack up? 67% of employees believe that they’re paid fairly, and a whopping 94% of employees are satisfied with their benefits. 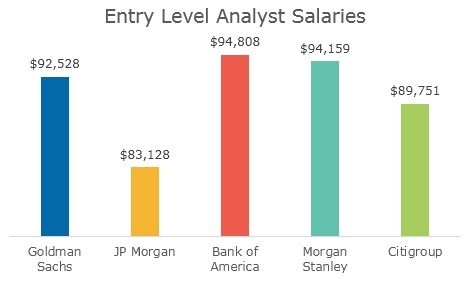 Here’s how Goldman Sachs compares in salary to other large investment banks. Although there appears to be a large discrepancy between these other firms, let’s take a look at the differences between these firms in total compensation. As you can see, Goldman jumps over two other firms and gets within striking distance of the other two when accounting for total compensation, putting them in the middle of the pack. Unsurprisingly in the world of finance, Goldman Sachs employees report working long hours. 75% of employees report working 10 hours or more, and nobody reported working less than 8 hours a day. 50% of employees also reported that the work pace was incredibly fast, so don’t expect much time for relaxation during your work day. Many expect the work environment to change within the next year, with the transition of Marty Chavez to CFO in April. Chavez is reportedly a huge proponent of automation and company efficiency, and warned employees to step up their skills if all they did was “push buttons.” There may be a huge shift within the company towards software development and automation techniques in the coming years, so expect a shift in the work environment as a result. Want to learn a little more on some of the most prestigious banking institutions in the world? Check out our company guides on Bank of America and JP Morgan. Looking for more career advice? TransparentCareer offers free data on career navigation, compensation packages, and salary negotiation. Sign up for a free account here.